COCOA — A plethora of plastic bottles, soda cans, newspapers, cardboard boxes and assorted trash from Palm Bay, Barefoot Bay and Malabar cascaded from the back of Waste Management’s Route 97 truck, piling onto the cement. Welcome to the “tip floor” of the Single Stream Recyclers plant, the first of its kind on the Space Coast. Raw materials from Brevard County’s residential recycling carts and other sources get dumped here — 6, 000 to 7, 000 tons per month — for sorting, bundling and shipping for sale around the globe. On the south side of the tip floor, a tinkling waterfall of broken glass tumbles from a rectangular wall slot, pouring into a sharp-edged heap. To the north, a yellow Caterpillar loader digs into house-sized mounds of recyclables and dumps them into a large green hopper, where a conveyor belt scoots them inside the facility. That’s where a noisy network of screening machines, optical scanners, electromagnetic fields and helmeted humans wearing yellow safety vests separates aluminum, paper products and plastics. Like hay from a farmer’s field, a baler compresses these commodities into rectangular blocks that get stacked five-high in the warehouse area, awaiting transport. “At the end of the day, all of our fiber — which is our paper and our cardboard — is shipped to China. It actually goes to the Rockledge railyard on U.S. 1, goes right from there all the way down to the Port of Miami, ” said John Hansen, co-owner of the plant, standing near the baler. “We ship six to 10 shipping containers a day of the fibers, ” Hansen said. Before SSR opened, Brevard County’s recyclables got trucked to a West Melbourne transfer station for shipment to Orlando or Pembroke Pines, said Amy Boyson, Waste Management community affairs manager. Instead, SSR processes Brevard’s materials just northeast of Interstate 95 and State Road 520, on Cocoa’s western fringe. In 2008, the Florida Legislature set an ambitious statewide goal: Recycle 75 percent of materials heading to the landfills by 2020. Brevard County’s recycling rate has increased from 45 percent in 2011-12 to 55 percent last year, said Hillary Arena, county recycling coordinator. Brevard’s 55 percent rate trails only Martin County (62 percent) among Florida’s 67 counties. Neighboring Orange (51 percent) and Volusia (48 percent) clocked in close behind, while Brevard significantly outpaced bordering Seminole (37 percent), Indian River (32 percent) and Osceola (31 percent). SSR is a private company that purchases recyclable materials from Waste Management, various cities and towns, and other sources. Arena said Waste Management trucks in 1, 400 to 1, 500 tons of materials per month from homes in unincorporated parts of Brevard, and Waste Management pays the county 40 percent of the sale proceeds per a revenue-sharing agreement. From last October through September, the county received $317, 658, she said. 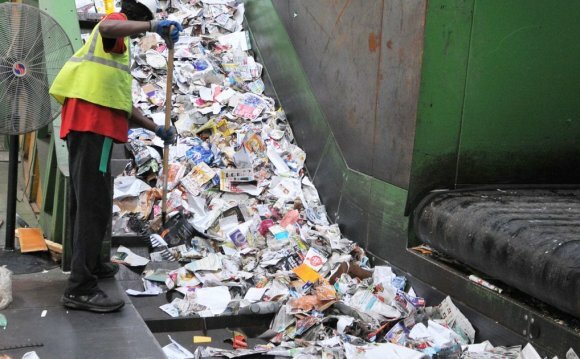 To analyze the recycling stream, the county has inked a $20, 000 contract with the Florida Institute of Technology’s Office of Research. Students at the Cocoa plant will study contamination and revenue-potential rates of sample loads from various hauling routes across unincorporated Brevard. Results are expected by May. “They’re analyzing the recycling waste stream so we have an idea of some of those non-recyclables that people are putting into their carts. So we can say, ‘Hey, this is not recyclable. This is not what we want, ’” Arena said. Hansen and Eric Konik, a high-school friend, operated hauling businesses during the 1990s in Wisconsin. They teamed up and built a construction materials recycling facility in 2006 in Milwaukee. After selling the enterprise a few years later, Hansen consulted with Waste Management, building recycling facilities across North America. Waste Management initially planned to open a MRF off State Road 520 just west of the Cocoa Expo Sports Center, but dropped that idea in summer 2013 after neighbors and the Brevard County Planning & Zoning Board objected. The Skull Valley Indian Reservation is the Goshute Indian reservation located approximately 45 miles southwest of Salt Lake City, Utah. It belongs to the Skull Valley Band of Goshute Indians of Utah, a federally recognized tribe.